"This quirky, irrepressible picture book lists all the places where you can enjoy a book (or two, or three)...You Can Read is a perfect storytime choice for sharing at school, library, home...'EVERYWHERE!' Highly Recommended." 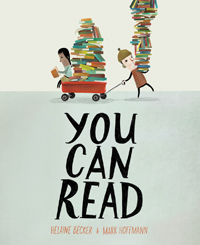 "You Can Read is a delightful picture book that is funny, endearing, and appealing for children of all ages. From the beginning sentence, to the last page, readers are taken on a whirlwind adventure to many places where one can celebrate the joy of reading." "Children will find it amusing that they can read on a toilet or in their underwear! A fun read-aloud for a storytime or class visit. This book is definitely worth purchasing." "Will have librarians, teachers, and book mavens immediately reaching for it...This will pair nicely with other books about the pleasures of reading and can be used to invite conversation with kids."